For an ideal steering system relay arm (tie rod) should follow the same arc as the suspension follows. Practically it is impossible to achieve due to nonlinearities in the motion of suspension. When the wheel moves in the jounce and rebound, relay linkage will follow an arc which will pull the steering arm to the right and causing a left hand steer when located behind the centre of the wheel. When inboard joint located below the wheel centre and linkage also located at rear of front wheel centre, at jounce a left hand steer will be produced and right hand when it goes into rebound. Three types of forces are normally seen in vehicle tire. The reaction in the steering system is due to the moment about steering axis, which must be reduce to control the wheel steer angle. Fzr sin λ = Sine angle of force component acting laterally and parallel to king pin axis. The moment is zero when no steering. 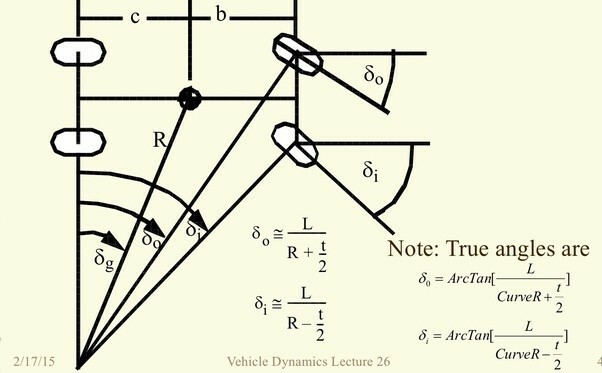 When steering, because of this force vehicle tends to lift, Increasing the steering effort and also self-centring force. Fzr sin γ = Force component in the direction parallel to caster angle seen in side view. Moment due to both wheel is opposite in direction. This force balance the left right wheel load. This may result into wheel toe-in and asymmetry of tie rod resulting in its push or pull. Torque gradient depends upon wheel offset at the ground, caster angle, left right load difference in cornering, front and rear suspension roll stiffness, Suspension roll centre height, centre of gravity height, lateral acceleration level.